Jack Mook is a tough guy who never really yearned to be a father. 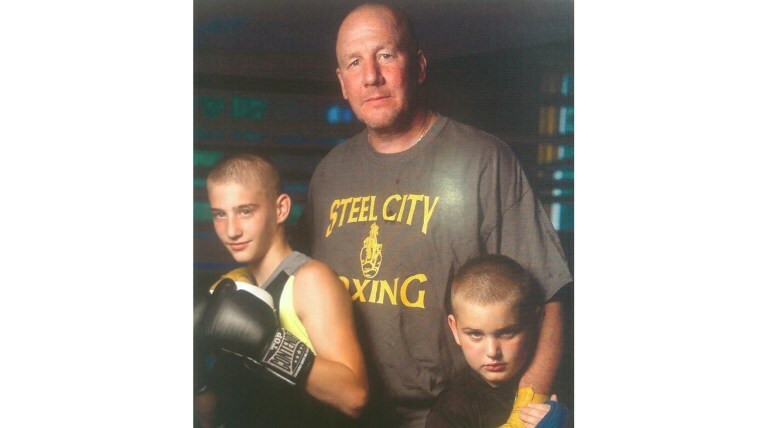 But when the Pittburgh police detective and Army veteran met two boys at his boxing gym who really needed a family, he knew what he had to do. Today, the boys, Jessee, 11, and Joshua, 15, still call him “Coach,” but they have also become Mooks. The no-nonsense detective, a lifelong bachelor, became an official family man on Sept. 16 when he did the best thing he has ever done: He adopted them. The boys grew up in extreme poverty, Mook said, and were moved from their parents’ home to foster care with relatives. When he brought them home last year, they were filthy and flea-bitten, he said; they didn’t have beds to sleep in, and without toothbrushes, they had rotting teeth. Mook has seen a lot in his years with the police department, but the boys’ circumstances were the worst he had ever seen. Mook met the siblings when Joshua was around 9 and began training at the Steel City Boxing gym, a nonprofit organization where kids receive mentoring. Mook became Joshua’s trainer; the two bonded. Then Joshua stopped turning up for daily workouts, and Mook went looking for him, as CBS News first reported. Joshua opened up, and as his tears fell, the details of his home life came pouring out. Mook wondered, what kid wants to escape home to go to school? Mook told city officials he wanted to care for them. “A caseworker told me they were fine, and I said they’re not fine,” Mook recalled. After the relative caring for the boys had a run-in with police, Mook said, he got an emergency order making him their foster parent. Officials later asked if he would consider adoption. “Right away I said, ‘Let’s do this,’” he recalled. The boys are thankful for their new life. If the boys had stayed put, Mook bluntly predicts they would have become criminals. “I’ve worked the streets for 22 years, and without structure and discipline they’d be put in juvenile detention and probably jails later on,” he said. As Mook navigated the adoption process, he worked to instill in the boys the same sense of discipline and responsibility and respect he learned from his father, a retired assistant police chief for the city. Mook has also been busy cooking healthy meals, training the boys at the gym and making sure homework gets done. “My main focus is that they’re going to be self-reliant and that they’re successful in life and able to make a living and take care of a family some day,” Mook said. The boys are earning good grades in their new schools and each won a Golden Glove boxing title earlier this year, Mook says proudly. “They’re doing perfect,” he says. Life has gotten even better since their union became permanent. Pittsburgh firefighter Geo Heinlein, a fellow trainer at the boxing gym and the boys’ godfather, says they have done a “complete 180” with Mook. They are thriving and growing more confident. For Mook, who was an Army paratrooper in the Gulf War and loves adventure, parenting may be his toughest, yet most rewarding endeavor.